Decaying infrastructure - be it pipelines, sewers or the electrical grid - seems to be the topic-du-jour in the US lately. Is this a sign that the point of limiting returns has been reached and collapse has beugn ? I think probably not - its more likely to be the result of a lack of investment exacerbated by an ideological rigidity that eschews public investment. That said, a steep post peak oil production decline curve, combined with a shortage of skilled workers and an aging population could make the task of renewing all this infrastructure from the "great society" years much more challenging than it should be. "When I see events like these, I become concerned that we've lost focus on the core operational functionality of the nation's infrastructure and are becoming a fragile nation, which is just as bad — if not worse — as being an insecure nation," said Christian Beckner, a Washington analyst who runs the respected Web site Homeland Security Watch (www.christianbeckner.com). British oil company BP announced this month that severe corrosion would close its Alaska pipelines for extensive repairs. Analysts say this may sideline some 200,000 barrels a day of production for several months. Then an instrument landing system that guides arriving planes onto a runway at Los Angeles International Airport failed for the second time in a week, delaying flights. Those incidents followed reports that the National Security Agency (NSA), the intelligence world's electronic eavesdropping arm, is consuming so much electricity at its headquarters outside Washington that it is in danger of exceeding its power supply. I suspect one sign of a collapsing society is an increase in corruption. Greg Palast has a report on the emergency plan for the flooding of New Orleans. The CSM has an article on proposals for increasing the efficiency of the grid in the US. Long accused of dragging its feet on raising energy-efficiency standards for products, the Bush administration has proposed its first such standard. Its proposal attracted little attention, since it didn't mean better dishwashers or more fuel-efficient cars. Instead, it deals with transformers - those ubiquitous gray canisters that hang from utility poles and could save the nation billions of dollars if they were upgraded. The question is how extensive the upgrade should be. Besides saving an estimated $9 billion in electricity costs, the Bush administration standard, unveiled Aug. 4, may also eliminate the need to build 11 new power plants over a 28-year period, the Department of Energy (DOE) reports. They would also reduce pollution and boost the reliability of the nation's electric grid. But instead of celebrating the proposal, energy and environment advocates say DOE has opted for "a very weak proposal" - one that fails to save additional mountains of energy and pollution that a slightly tougher regulation would achieve for about the same cost. The tougher standard would save much more than the DOE proposal over 28 years - about 120 billion kilowatt hours of electricity - or enough energy to power 10 percent of US households for a year, they say. Transformers are the first such proposed standards to emerge. And that may be a good thing - because the nation's electric grid, and particularly its transformers, are under more stress than ever. Though the recent heat wave didn't cause large-scale blackouts as feared, a slew of smaller outages popped up across California and other states, many attributed to overheated transformers. In late July, nearly 1,400 transformers blew in Northern California, leaving more than 1 million people without power, local news media reported. Big transformers at power plants convert electricity to high voltages for efficient transmission over long distances, then smaller neighborhood distribution transformers reduce it back to levels safe for home use. Higher-standard transformers are more expensive, heavier, and cost more to install, but also bear up far better under peak loads and make the grid more reliable, analysts say. That's good, because the nation could see a significantly higher rate of older transformers failing than in years past, says Alison Silverstein, a power industry consultant. BP has cut oil production from Prudhoe Bay down to 90,000 bpd after another problem, this time a broken compresser. BP PLC said Wednesday that oil production at its Prudhoe Bay oilfield in Alaska, already running at half capacity due to pipeline corrosion, has been cut by 90,000 barrels per day (bpd) for several days due to a technical fault. A company spokesman said output at the biggest oilfield in the United States had been reduced to 110,000 bpd after a natural gas compressor in Gathering Center 2 failed. "We anticipate that fixing the compressor will require several days," said BP spokesman Daren Beaudo. Prudhoe Bay had previously been pumping about 200,000 bpd, around half its normal output, after serious corrosion in a pipeline led BP to shut down the eastern half of the field earlier this month. Joel Makower at WorldChanging has a post on The New Energy Companies - it seems everyone is getting in on the act. One of the more noteworthy aspects of what has come to be called "the clean-tech revolution" is that industry sector lines are blurring. It's no longer just oil, gas, coal, and utility companies that qualify under the "energy company" moniker. As the world's energy choices diversify, so, too, has the number and nature of companies jumping in. There are now "energy companies" emerging from a variety of decidedly non-energy sectors, from electronics to chemicals to aerospace to ag. Consider Dupont, which just announced a $50 million expansion of a facility to manufacture materials for solar panels -- specifically, the panels' protective backsheets. This is hardly the first big energy bet for Dupont, the company who's tagline was, famously, "Better Living Through Chemistry." For example, it boasts an entire division making "more powerful, more durable, and more cost-efficient fuel cell materials and components," as the company puts it. In May, Dupont Fuel Cells introduced components that provide direct methanol fuel cells -- the kind that someday will power laptops and cell phones -- with improved overall power performance and longer run-times. Another big chem company, Dow, boasts the world's largest fuel cell project, a partnership with General Motors, in which GM aims to prove the viability of hydrogen fuel cells for large industrial power. GM is powering fuel cells with hydrogen created as a co-product at a Dow facility in Freeport, Texas. Meanwhile, 3M, the maker of Post-its and Scotchguard, similarly has a fuel cell division, developing membranes and other component parts. I've written on several occasions about GE, which already is the largest U.S. wind turbine manufacturer, and which also is engaged in manufacturing solar, fuel cell, coal, nuclear, and other energy technologies. Who else is in the energy business? There's aircraft maker Boeing, which recently signed a multi-million dollar contract to supply concentrator solar cell assemblies to an Australian solar company. Owens Corning, best known for its pink building insulation, recently introduced a new "single-end roving and knitted fabric," WindStrand, which could enable lower costs and higher performance for wind turbines. The electronics companies have long been in the energy biz. Fujitsu, Hitachi, Kyocera, Sanyo, Sharp, Siemens, and Toshiba are among the many firms in that sector making solar cells, fuel cells, components for wind turbines, and control technologies that make all of these things work more efficiently. Sharp, for its part, is the world's largest maker of solar cells and modules. And then there are the IT companies -- the nice people who brought us the Internet and the personal computer, among other things. For several years, they've been investing in ways to improve the electricity infrastructure to make it more efficient and reliable. After all, the new "smart grid," in which homes, businesses, and appliances "talk" to one another to determine whether and when to power up or down, will require switches, routers, and sophisticated software -- the same things that run the equipment used to transmit and receive this blog. The fusion of info tech with energy tech has led IBM and Cisco, among others, to develop products and technologies to help deliver energy more efficiently. Who else could become an "energy company"? Almost anyone who makes metals, plastics, advanced materials, or coatings. Software companies, who may write the code that weaves the cacophony of energy producers into a harmonious system. Big-box retailers, whose spacious, flat roofs could collectively become solar farms for the surrounding community. And, by extension, big real estate developers -- of malls, warehouses, industrial parks, and other large complexes -- creating microgrids of solar, wind, geothermal, fuel cell, and other energy sources. Some of these players already are emerging, with many more still to come. It may not be long before we're asking, "Who's not an energy company?" Bruce Schneier logs the latest unnecessary freak out over security - this time bacuase an airline passenger dropped his iPod into the toilet. Tim Burrows has a review of tonight's Four Corners special on global warming - "Prime Minister needs more evidence" (I'd suggest calling it "The Rodent and the Time Machine"). Perhaps the most interesting segment of the program, at least for those familiar with the climate change debate, were the segments with John Howard (Australian Prime Minister). He was to my mind somewhat uncomfortable during the interview sessions. During the final clip, he stated that he "wanted to see the evidence" that significant emissions cuts (60% by 2050) were required before implementing a carbon trading system. I'm not sure what he is looking for. A message coming out of a time machine? "Greetings from 2050. It's really hot here". The Intergovernmental Panel of Climate Change (IPCC) has hundreds of scientists working to produce reports that are peer reviewed and dissected to produce some of the most thoroughly reviewed pieces on climate change and its impacts. As Tim Flannery says they are "as dry as dishwater", but they represent the best understanding of climate change science that is available. They are also now very clear in their language. The National Academy of Sciences of just about every nation on earth has agreed that significant cuts are required. I could go on. I ask again - what evidence is he looking for? It sounds like Tim Flannery needs to work on his motivational skills, with Crikey reporting that his latst talk on global warming had people contemplating leaping from the balcony. im Flannery’s keynote address to the Melbourne Writers' Festival on Friday night at the Melbourne Town Hall must have left more than a few punters feeling decidedly blue. The vision he paints of the coming impacts of climate change is at times little short of apocalyptic. Yet Flannery’s vision is no exaggeration. And given the stakes, there would be something obscene about soft-pedalling his message just to make our Friday evenings a little cosier, our sleep a little easier. And so, as in his book The Weather Makers, Flannery pulled no punches. But amid all of the talk of melting ice sheets and Arctic pack ice, rising seas, drowning polar bears, fatally confused bird life and monster storms, he seemed to leave scant room for hope. During the Q&A session at the conclusion of his speech, one audience member jokingly remarked that her friends were considering leaping from the balcony. I’ve followed Tim’s work since the publication of The Future Eaters 12 years ago. A passionate discoverer and documenter of nature and natural history, he’s a great communicator, too. But with such a profoundly disturbing issue as climate change, the difficulty lies in startling people out of their reverie without turning them into despairing balcony jumpers. It is a difficult balance and -- eloquent as he was -- I don’t know that he struck it on Friday night. This is not to take away his due. Tim Flannery’s is an important voice of warning that has helped greatly in shoehorning climate change onto the mainstream agenda. This was, after all, the ultimate reason for his appearance at the town hall. Perhaps in the end, it is only his job to deliver the bad news, uniquely placed as he is at the, er, coal face of nature’s continuing decline. I'm predicting a fresh outbreak of violence in Chad sometime soon, after reports that the Chadian government has kicked Petronas and Chevron out of the country for not paying their taxes. Can't have that sort of bolshie behaviour from a third world country, now can we ? Or is this just another example of the revival of resource nationalism ? Chad's president on Saturday ordered oil companies Chevron Corp. and Petronas to leave the country, saying neither has paid taxes and his country will take responsibility for the oil fields they have overseen. In remarks on state-run radio, President Idriss Deby gave the companies — part of the African country's oil production consortium that is led by ExxonMobil — a deadline of just 24 hours to start making plans to leave. "Chad has decided that as of tomorrow (Sunday), Chevron and Petronas must leave Chad because they have refused to pay their taxes," Deby said in a message broadcast on state-run radio. Deby said Chad, which is one of Africa's newest oil producers and is setting up a national oil company, would take over the oil fields that have been overseen by the American and Malaysian companies and account for some 60% of its oil production. Mark D. Boudreaux, a spokesman for ExxonMobil, told The Associated Press by e-mail that neither his company, nor affiliate Esso Chad has been asked to leave the country. If the two companies are evicted, Chad could seek help from China, which has taken an active interest in Africa in its search for raw materials like oil and metals. Of course, its possible President Deby may simply come to a sticky end - when I visited reddit today the top rated tales were about the untimely demises of whistleblowers about NSA wiretapping and an investigator looking at vote rigging in Florida. I'm always amazed at just how many people unfortunate enough to learn things that someone would rather keep hidden are soon found deceased - I wonder if accountants have nightmares about doing the books for companies that turn into the next Enron ? Two whistleblowers — one in Italy, one in Greece — uncovered a secret bugging system installed in cell phones around the world. Both met with untimely ends. The resultant scandals have received little press in the United States, despite the profound implications for American critics of the Bush administration. Bove had also revealed that his employer, Telecom Italia, had allowed illegal "spyware" — undetectable wiretaps — to infest Italy's largest communications system. His testimony helped to uncover the unsettling relationship between SISMI chief Marco Mancini and Telecom Italia head Giuliano Tavaroli. (Mancini, recently arrested by Italian investigators, has also come under some suspicion for his possible role in the strange affair of Major General Nicola Calipari, killed by American troops in Iraq.) In the 1990s, Bove had received wide praise for helping to secure convictions of two bosses in the Camorra, Naples' answer to the Sicilian Mafia. The case of Costas Tsalikidis — an engineer for Vodaphone, Greece's top telecommunications firm — offers a similar picture. Tsalikidis discovered an extraordinarily spohisticated piece of spyware within his company's network. The Prime Minister and other top officials were targeted, along with Greek military officers, anti-war activists, various business figures — and a cell phone within the American embassy itself. This page gives a full list of the targets, very few of whom could be considered as having even a remote connection to terrorism. 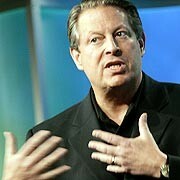 Carbon Sink points to an article on Al Gore in this weekends local paper. Some essential reading and viewing this weekend. First up is "The Resurrection of Al Gore" in the Good Weekend magazine. The article by John Heilemann (which is not online) talks up the prospect of Gore running for President in 2008 which is hugely encouraging. There is no politician on the planet more committed to the issue of climate change than Al Gore, and IMO it is critical for the future of the planet that he runs and wins in 2008. "The principal source of disappointment was not the dashed expectations for me or my family," he explains, "but the consequences for the country" of Bush's victory. "What the country has subsequently gone through was much worse than I ever thought, but I expected it to be bad." What's clear is that Gore would love to be president, but the thought of the whole awful business of getting there makes him nearly nauseous. Please run Al. One man's nausea is a small price to pay to give the planet some hope. I'm nauseous every time I see Bush on TV, and there millions (billions?) who feel the same. Past Peak reports on what may be the first hurrican to hit the Gulf of Mexico this season - Ernesto (The Oil Drum can rest easy at last - they also have a post on the location and vulnerability of offshore rigs in the gulf - BHP are probably relieved they have bailed out of the gulf region). For a couple days now we have been talking up Ernesto and warning that there was a significant chance that this could be the new big story. After looking at the situation today, I am convinced that things could be very bad indeed. I always try not incite undue worry, but Ernesto could get ugly. Those of you in the Gulf Coast need to re-examine your hurricane plans, especially is you live in the north Gulf from Houston to Tallahassee. A very deep layer of warm water in the northern Gulf could allow for Ernesto to become a very powerful hurricane if it reaches the area. The Energy Blog notes that Venezuela has increased their oil reserves number to include heavy oil reserves in the Orinoco belt, and are planning to increase production by just over 500,000 barrels per day. TreeHugger has a post on neo-luddite Michael Crichton nad his paranoid theories about a global warming conspiracy. The fossil fuel is so impressed with this convenient paranoia that they've given him a word for "notable journalistic achievement". Bravo Mr Chrichton - Frank Luntz would be proud of you. OnEarth, the NRDC's magazine, has an interesting little sidebar about a book prize created by the American Association of Petroleum Geologists (AAPG) for "notable journalistic achievement, in any medium, which contributes to public understanding of geology, energy resources or the technology of oil and gas exploration." That's a worthy goal, no? The public doesn't know much about the subject and would certainly benefit from more knowledge. So who won the prize this year? Michael Crichton. Yes, the author of Jurassic Park. He won for his novel State of Fear, but the judges also cited the dinosaur book (for some reason). WorldChanging (which seems to be engaging in a merger of sorts with the WorldWatch Institute - new green meets old green) has a post on a new biofuel - "Vernonia Oil and African Green Chemicals" - which can also be used to produce bio-based plastics and other chemical products . In July, the government of Ethiopia signed an agreement allowing a British biotechnology firm to commercialize the oilseed plant vernonia as a renewable source of industrial chemicals. Long dismissed by Ethiopian farmers as a nuisance shrub, vernonia, also known as ironweed, is considered a potential replacement for petroleum in a variety of industrial uses. The plant’s shiny black seeds produce an oil rich in epoxies, which can be used to manufacture innovative bio-based paints, adhesives, and plastic products. Though it has been grown successfully in a variety of locations, vernonia thrives naturally within 20 degrees of the Equator, and has been particularly prolific in Ethiopia. The new commercialization deal, which took place under the auspices of the United Nations Convention on Biological Diversity's Access and Benefit Sharing Agreement, gives the British company Vernique Biotech access to the plant for the next 10 years. In exchange, the Ethiopian government will receive royalty payments and profit shares, while hundreds of local farmers will have an opportunity to boost their earnings by growing the oilseed on land too poor for food crops. Studies show that use of vernonia-derived oils has the potential to significantly offset petroleum use and related fossil-fuel emissions. In 1992, the United States consumed roughly 227 kilograms of petroleum per person to produce plastics and industrial petrochemicals; according to scientists, replacing those feedstock with vernonia oil could have reduced emissions by up to 73 million kilograms annually. In 2004, the U.S. industrial sector consumed about 5.1 million barrels of oil per day, or 23 percent of the nation’s total. The naturally epoxidized vernonia oil is also being considered for pharmaceutical uses, such as alleviating psoriasis. Billmon reports that the Unabomber has been released from prison to investigate the London underground bombings. For Australian readers - 60 minutes has a segment on peak oil tonight. You're about to hear two of the scariest words in the English language — "peak oil". Effectively, they mean the end of the world as we know it. The point where oil production reaches its absolute peak; the point when supplies start running out. And the doomsayers are convinced we're almost there. So, if you think paying $100 to fill your tank is painful, I hate to tell you, this is as good as it gets. It'll get worse, much worse. Two dollars plus per litre by Christmas for a start. Naturally, the oil companies say stay calm. We'll be right for a 100 years at least. But then they would, wouldn't they?